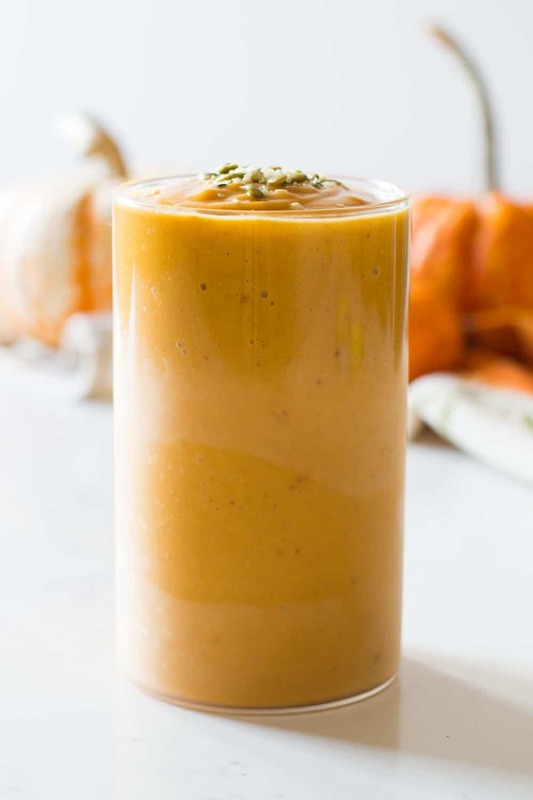 This Healthy Pumpkin Smoothie is out of this world!! Seriously! 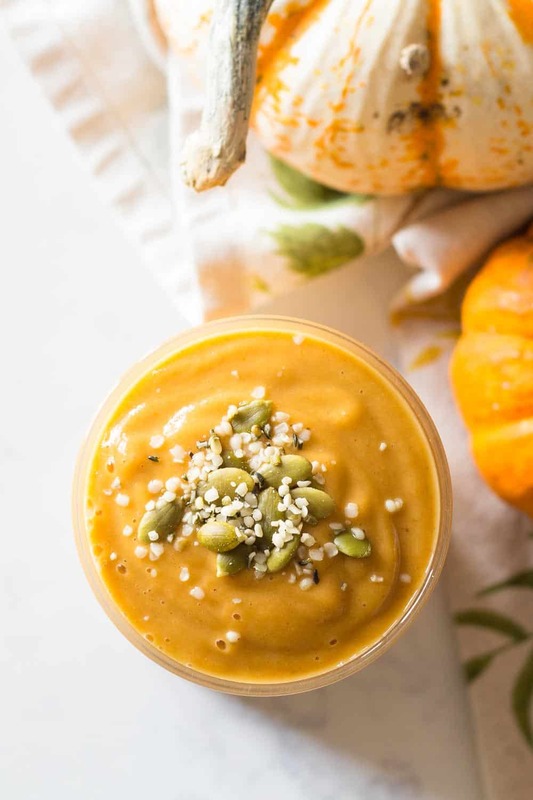 A smoothie that tastes like pumpkin pie but healthy, paleo and vegan. How is that for an AWESOME fall smoothie? Ever dreamed of having pumpkin pie for breakfast? I thought so. Let’s keep it healthy though, shall we? Here is an easy to make, grab and go breakfast that tastes like pie *angelical aaaaaahh*. If you love smoothies for breakfast make sure you also check out this Strawberry Smoothie sans Yogurt. You’ll love that one, too!! So, I don’t know what it is but folks seem to not like neither banana nor yogurt lately, eh? No worries, I can accommodate and do magic with all kinds of ingredient subs. 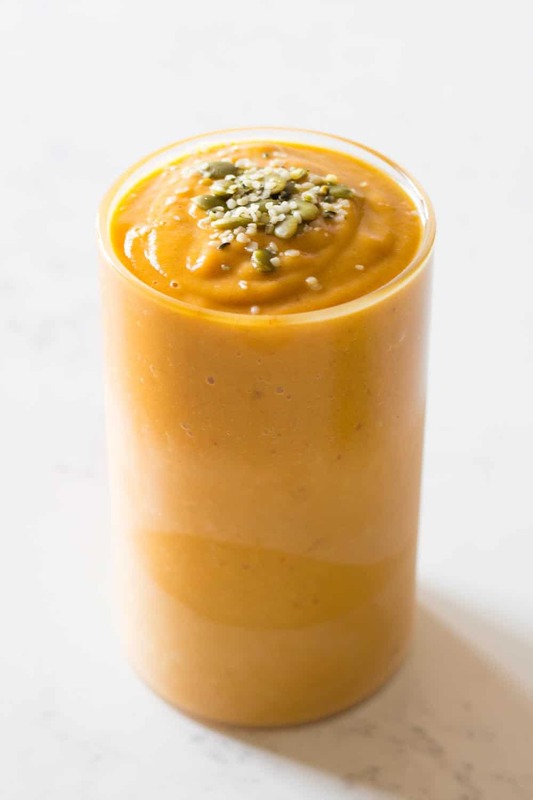 Here is your pumpkin smoothie without banana and without yogurt. If you freeze pumpkin puree you get basically the same consistency as with frozen banana. And the yogurt is totally not necessary in any smoothie at all. Use almond or coconut milk and make it vegan and paleo that way on top. 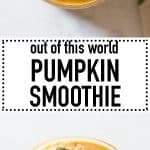 If you love your smoothie extra freezing cold, freeze the milk of your choice at the same time as the pumpkin puree. If you freeze it in an ice cube tray it takes only a couple hours. A wonderful way to both sweeten and thicken smoothies is by adding dates. Dates are a natural sweetener and because they’re super sticky they also thicken the smoothie to this amazing creamy consistency. Dates are by far my favorite way to sweeten anything. From smoothies to tarts, cookies, and more. They are an amazing “glue” or “smoother” in many recipes. What the heck is Lúcuma?? Lúcuma is a delicious fruit from the Andean Valleys of Peru, Ecuador and Chile. I grew up eating delicious Lúcuma ice cream and when I saw the powder at the health food store I squealed with delight! I immediately bought it and ate it by the spoon full. SOOO GOOD!! Lúcuma tastes like a cross between maple syrup and citrus. Did I convince you already you need this as staple in your pantry? Theres is not much nutritional information available for lúcuma powder so I can’t say it’s super healthy it simply is super tasty! You can get lúcuma poweder here* It’s worth it! You can put it in ALL your smoothies as natural sweetener and simply taste booster. A couple hours before making or the night before, freeze pumpkin puree in an ice cube tray. 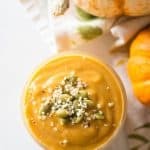 Add frozen pumpkin puree, frozen mango, PITTED medjool dates, lucuma powder, protein powder, pumpkin spice and almond milk to a high speed blender and blend until super smooth. Have you seen the sugar content!!!! I was out of bananas but had mango, and this was the best pumpkin smoothie I’ve ever tasted; real pumpkin flavor. Thank you! This looks delicious Lorena! I also LOVE the flavor lucama gives in smoothies. so yummy! Thank you Jess!!! What an honour to see you around here! I follow you on Instagram, haha. The world is small.